Activities: Decorating igloos and tipping parties. How Often Do you Go On CP? Pretty much daily. Goes On This Flag: U.S. and Australia. Goes On These Servers: Blizzard, Mammoth, South Pole, Big Surf and Down Under. 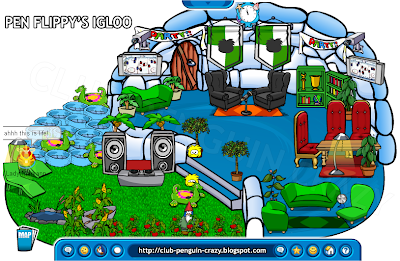 Fave Room on CP: Pet Shop, thats where i earn my coins, buy my pets and buy some furniture! best room ever! Buddies in CP: Ok i got 95, id be here all night to name them all but here's some! Lady Maryann, Bike boy96, Straw000, Chuckleloo, Concerns1234, Delpiro, Ice Vampiro, Fab flower, Kz moo, Mishmash215, Mc Vipa, Mycatcartmen, Pandadicto, Sand flipper, Snow dobby 2, Sereena25, Steliosboy1, Weamer, Zoezoe11 and tonnes more cool friends! Yippee yippee, Glad am I.
Yippee yippee, My, Oh My. Awesome Story: How do you get out of a room with no windows and no doors and only a table? Climb through the hole and out into the open. hop on the horse and ride away! 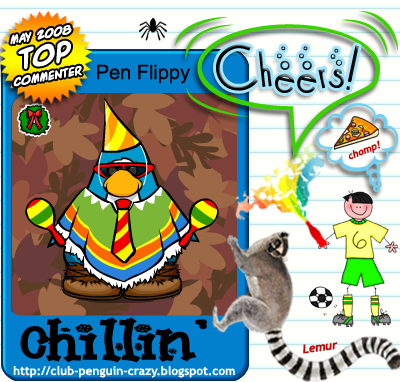 Pen Flippt sounds like a really cool penguin! oh and that live traffic thing creeps me out a little! I know it has nothing to do with Pen Flippy but when I saw my city I started freaking out! LOL!